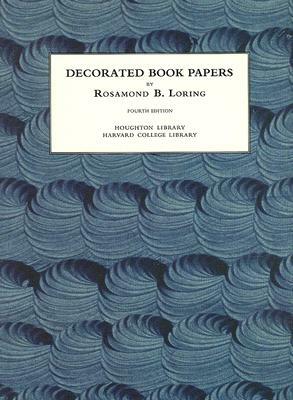 Download a PDF of page 70 which contains a correction Decorated Book Papers, first published in 1942, remains one of the standard works on its subject. In it, Rosamond Loring, collector and maker of decorated papers, explores the history and use of decorated papers in the book arts: the early history of endpapers and marbling, marbled endpapers, printed endpapers, Dutch gilt or Dutch flowered papers, paste end-papers, nineteenth-century endpapers, publishers' endpapers, and pictorial endpapers. Appendices are devoted to the art of marbling, the preparation of paste papers, and a listing of some early makers of decorated paper. The present edition reprints Loring's text, unchanged from the first, second, and third editions, and the memoirs of Loring by Walter Muir Whitehill, Dard Hunter, and Veronica Ruzicka, first published in the second edition (1952). In addition, there is a new account of Loring's life and work by Hope Mayo. The seventy-three color illustrations have been newly photographed from the actual paper samples, themselves from Loring's collection, that were included in Philip Hofer's personal copy of the deluxe first edition.